On this Christmas Eve, I thought I would share with you one of my earliest publications. This one on the topic of the hour. 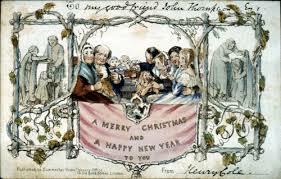 Perhaps the most important of the changing elements was the country’s attitude toward Christmas. 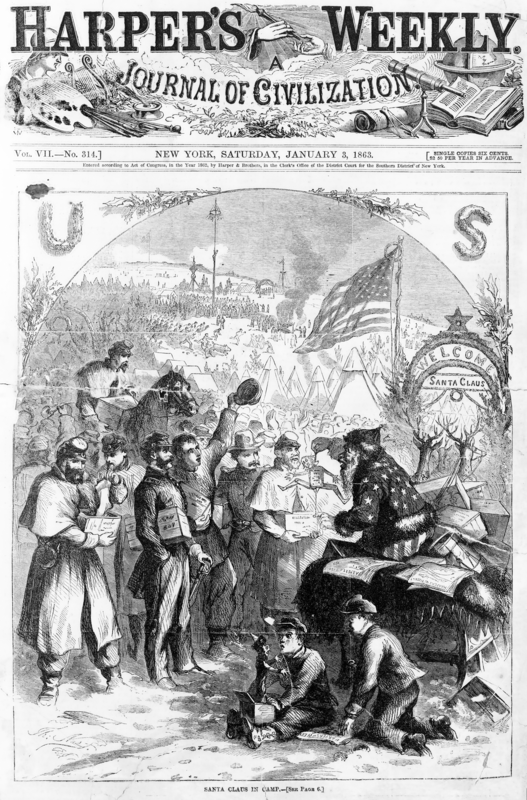 By the coming of the Civil War the antipathy shown toward the celebration by some religious groups and like-minded individuals was rapidly softening. Indeed, “by 1859, the general attitude towards Christmas had changed sufficiently for the Sunday School Union” to accept the holiday to such a degree that it published hymns and accounts of celebrations.2 This was emblematic of a general acceptance of Christmas by many denominations. This changing of views combined with another ongoing force to further shape and help define the American Christmas. It was within such an atmosphere that Christmas as we know it began to manifest itself. This essay will look at various aspects of Christmas celebrations during the 1830-1860 period, both those that reach down to us today and those which are but memories. A major difference between the antebellum celebration and that of today was the variety of gift-bringers dotting the landscape. Of varying ethnic or national backgrounds, they scurried across the land on their mission to reward or punish. Already by 1860, though, one was beginning to overshadow the others. With the coming of the war and the enlistment of Thomas Nast to his side he would come to dominate, but in pre-Civil war America he had competition. The greatest of all modern Christmas icons, Santa Claus, was evolving during the period. Although it was to be several years before Nast was to give the jolly, round one his most enduring form, “Santa Claus” of 1860 would be easily recognizable to the modern child. “Santa,” of course did not spring full-blown upon America, but was born of legend and centuries of permutation. He was the amalgamation of the traditions of gift-givers of many cultures, a bishop legendary for his kindness, and the pens of several early 19th-century American writers. The Nicholas who reemerged in the early 19th century was soon transformed into a secular saint who was to play a central role in what was to become a folk festival instead of a purely religious occasion. This revitalization came through the confluence of American literary efforts and the increased immigration of Germans and others wont to celebrate Christmas. Irving was the next to take up Nicholas’ cause and his inclusion (twenty-three times) of him in Knickerbocker History did much to bring the old saint before the public. Clement Moore’s now universal “A Visit From St. Nicholas” (“The Night before Christmas”) was published in 1823. Its synthesis of many elements of the legend was a boon to the Christmas celebration and the exaltation of Nicholas. Another major influence was Kriss Kringle’s Book, offered in 1842. The book told of St. Nicholas, or Kris Kringle, a “nice, fat, good humored man” who brought gifts for good children.29 The descriptions of Santa Claus in these and other books and the illustrations of Robert Weir, brought about the change in image from a thin ascetic to a robust character. As is clear from the above, St. Nicholas, Kris Kringle, and Santa Claus had all become synonymous by mid-century. As such, it is appropriate to discuss the evolution of terms. Santa Claus is, of course, a corruption of St. Nicholas. Popular thinking has it that the Dutch were responsible for this alteration, but this appears to be untrue. Linguists view it as having originated in Switzerland where such phonetic changes were consistent with normal usage. The analogue Dutch term “Sinterklaes” postdates the original corruption.30 Kriss Kringle was a corruption of Krist -Kindl, or Christ-Child (see below), that came to be associated with the jolly, fat man instead of a cherubic child.31 Exactly when these variations occurred is impossible to pinpoint, but they were well in place by 1860. Santa Claus, then, was well with us by 1860. A thin, ascetic saint had added much poundage, undergone a secularization process, and a name change. In the process he was becoming the center of a folk festival that was to overawe all others. The concept of the Christ-Child as a gift-giver evolved in Germany. The Krist- Kindl appeared as a substitute for St. Nicholas partially because, some historians argue, the old gent was too redolent of Rome for some Protestant reformers.35 At any rate, the Krist-Kindl was portrayed as a cherubic child (boy or girl) who travelled by mule carrying gifts. Children set out a basket, filled with hay for the mule, to receive their gifts. The Krist-kindl concept was adopted by some Pennsylvania Germans.36 By 1860, however, he/she was rarely a part of Christmas; the role having been overtaken by the jolly elf who had appropriated the name. 1. Time-Life Book of Christmas, (New York: Prentice-Hall, 1987) p.7. 2. James Barnett, The American Christmas: A Study in National Culture, (New York: Arno Press, 1976), p.7; see also Katharine Rockwell, How Christmas Came to the Sunday-schools, (New York: Dood, Mead, 1934). 5. F.X. Weiser, The Christmas Book, (New York: Harcourt, Brace, 1953), pp.120-121. 6. Ken Brooks, “How Christmas Traditions Began,” Friends (Dec., 1979). 7. Barnett, p.11; Philip Snyder, December 25th, (New York: Dood, Mead, 1985), pp.121-132. 8. Irene Chalmers, The Great American Christmas (New York: Viking Press, 1988), p.22. 9. Alfred Shoemaker, Christmas in Pennsylvania, A Folk-Cultural Study, (Kurtztown, PA: Pennsylvania Folklore Society, 1959), pp.43,56. 10. Karen Cure, An Old Fashioned Christmas, (New York: Harry N. Abrams, 1979), p.127. 11. WPA, Ohio Guide, p.161. 12. Snyder, pp.172-181; Rockwell, p.143; William Henry Husk, Songs of the Nativity, (London: John Camden Hotten, 1868). 17. Lynne Cheney, “You can thank Louis Prang for all those cards,” Smithsonian, (December, 1977), pp.120-126. 19. See, for example, Indiana Journal, (December 3, 20, 1841). 21. Wabash Express, (December 26, 1855). 23. Brian McGinty, “Santa Claus,” Early American Life (December, 1979), p.50. 24. E. Willis Jones, The Santa Claus Book, (New York: Walker & Co., 1976), p.6. 27. Snyder, pp.211-212; McGinty, pp.51-52. 28. McGinty, p.53; Charles W. Jones, “Knickerbocker Santa Claus,” The New York Historical Society Quarterly, (October, 1954), 370-371. 33. Snyder, p.213; Gerard and Patricia Del Re, Christmas Almanack, (New York: Doubleday & Co., 1979), pp.69-70. 34. Harriet Kane, The Southern Cristmas Book, (New York: Bonanza Books, 1968), pp.222-229. 35. William Sanson, A Book of Christmas, (New York: McGraw-Hill, 1968), 105. 36. Shoemaker, p.43; Barnett, p.11. In January 1934, at the height of the gangster era, no one was more famous than Hoosier brigand John Dillinger. Newspapers, the radio, and newsreels breathlessly followed his exploits. During the Great Depression, that period of foreclosures, lost jobs and hunger, gangsters like Dillinger were often portrayed as modern Robin Hoods. Of course, this was pure romanticism. Though they may have stolen from the rich (or at least their banks), they seldom gave back much to the poor. Dillinger was one of those who became a folk hero. Known for his cool and polite manner as he robbed terrified tellers, Dillinger earned his reputation as Robin Hood for deeds such as refusing to take the few dollars a poor farmer had on him when he was unlucky enough to be in a bank that Dillinger was robbing. A real gentleman, that John Dillinger. 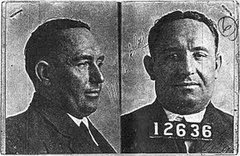 From Mooresville, Indiana, Dillinger had connections to West Terre Haute. While in prison for a small time robbery in his youth, met one Russell “Boobie” Clark in the state pen at Michigan City. Clark, a Vigo County native, had already made a shady name for himself. After being dishonorably discharged from the Marines following WWI, Boobie, like so many others, took advantage of the opportunities offered by the foolish and ill-fated social experiment known as Prohibition. Clark became involved in bootlegging. As a bootlegger he knew where all the speakeasies and “illicit” roadhouses were located. When just acting as middleman in the illegal liquor was not remunerative enough for Boobie, he began to rob the joints. In 1926 he was suspected of kidnapping two bootleggers from West Terre Haute and killing another in Danville, Illinois who was apparently out of favor with Cicero (Al Capone Territory) bootleggers. It was after these escapades that Clark was sentenced to Michigan City. There he met Dillinger and veteran bank robber like Charles Makley. Starting in 1933, after his release, Dillinger began a brief and meteoric career as a bank robber. There was no one Dillinger Gang. Dillinger changed partners with the promiscuity of a Hollywood starlet. Many criminals moved in and out the “gang,” but Clark and Makley were stalwarts. The new year 1934 was barely born when Charles H. Ray found out that the Dillinger Gang was casing his State Bank of West Terre Haute as a juicy target. On Saturday, January 6th, Ray was visited by Ivan Herring. Herring was West Terre Haute’s town Marshal. Evidently, Ivan was more well connected to the doings of the criminal element than most small town Marshals, for he had gotten word that members of the Dillinger gang were going to rob the bank of its Monday payroll funds. Herring had a snitch, whose identity he would not reveal as it would mean a “ride” for the underworld tattletale. Astounded and fearful, Ray contacted another banker named Howard Derry, who arranged for the bank president to meet with Terre Haute Chief of Police Armstrong. Word that the Dillinger gang was near was a call to action and a plan was put in place. It was decided that Ray would appear to pick up the funds from a bank in Terre Haute on Monday as usual. The Terre Haute police car would follow surreptitiously and foil the robbery. Charles Ray returned home to spend an anxious weekend. Monday morning January 8th, he drove to the bank on Wabash Avenue, went inside and came back out with a “dummy” package of money. At about 8:30 Ray did a u-turn on Wabash Avenue, dodging street cars, and headed toward West Terre Haute. In his rearview mirror he saw the Terre Haute police car. As he crossed the Wabash River bridge it all became too real for him. Waiting on the bridge was a Ford V8 (Dillinger’s gang preferred high-powered cars like that or Hudson Terraplanes, usually stolen, as getaway cars) with Ohio license plates. It was exactly the type of car Herring had told them the robbers would be driving. At least two men (three men was considered the minimum for a successful bank robbery: one to be the getaway driver, one to be a lookout, one to do the actual robbery) were in the car. The car began to follow Ray. 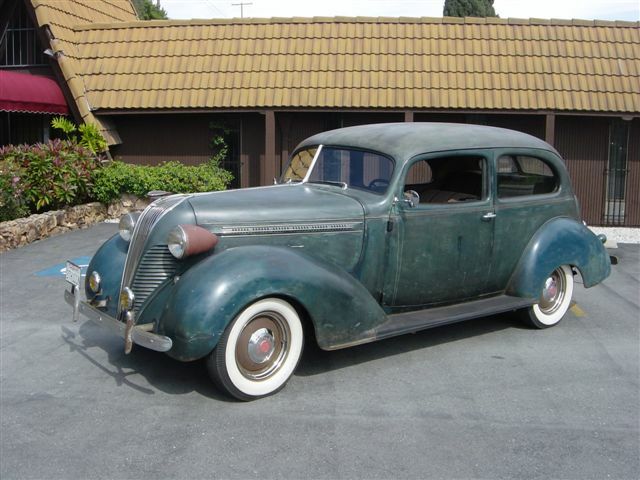 Hudson Terraplane, preferred getaway car of Dillinger. Bewildered, Ray drove on to his bank on Paris Avenue. He parked, looked around and hurried into the bank with his dummy package. When nothing happened Ray went out to the police car parked next to the bank. Finally, the police said they would try to find the robbers and sped off, They thought they were in luck when they spotted the car parked by the clay plant on the western edge of town. But as they approached tommy guns were thrust out of the Ford’s window as a warning and the car began to hurtle along the National Road to Illinois. The police car got “snarled in traffic.” The chance was lost. Ray and the police then tried to figure out what had gone wrong. Again they said they did not have instructions on how exactly to foil the robbery plot. Three robbers had been in the car. Dillinger and Clark were not among them, but they identified known gang members named Burke and Burt. Evidently hiding on the floor of the back seat along with his trusty Tommy gun was Charles Makley. Makley, known as Fat Charley, had spent Christmas in Florida with Dillinger at a gang hideout. They had a merry Christmas and exchanged gifts like jewly and a puppy for Dillinger’s girlfriend. After the failed robbery in West Terre Haute, Makley and the other gangsters continued west to a gang hideout in Arizona. That Monday night, Charles Ray noted in his diary that “Ivan knew the story. Our plan was perfect, but because police headquarters didn’t give the squad they sent out any information they missed a great chance” to capture some of the Dillinger gang. One must wonder if the failure was due to ineptness or a tip from an informant in the Terre Haute police that warned the gang of what might happen? Footnote: I recently interviewed a man who averred that his uncle was familiar with John Dillinger. He said his uncle encountered Dillinger in a speakeasy on South First Street in Terre Haute. During the “visit” Dillinger, tommy gun close at hand, joked he would never rob a bank in Terre Haute because he “was sure to get railroaded” as he attempted to get away. Dillinger was known to have spent some time in Terre Haute in October or November, 1933. 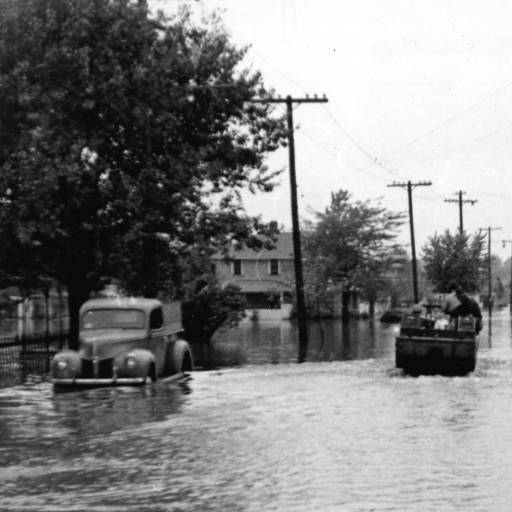 The people of West Terre Haute were used to floods and rumors of floods. In 1913 they had suffered through a “hundred year flood’ that arrived hard upon the heels of a devastating series of tornados and threatened to wash away the town. So, many people were prone to keeping an eye on the weather and peeking apprehensively over their shoulder for dark clouds. Among them was Charles H. Ray. The scion of an influential family, which counted an early Indiana Governor in its lineage, Ray was a mine owner and president of the State bank of West Terre Haute. His family lived part of their year in Terre Haute, part of it on the family’s farm along the Darwin Road southwest of West Terre Haute. He had many interests, served many causes, but he was also a man in love with his land. It is obvious from reading his diaries (which his family has kindly loaned me for my research) that his farm, long held by his family, was a loved center of his life. Like all farmers he was constantly aware of the weather. In his case it was particularly true because the farm was bordered on the east by the Wabash River. Packed between the pages of the diaries are the monthly meteorological reports issued by the weather bureau. Seldom did a day or two pass without a notation about the weather. This was especially true in the Spring of 1943. 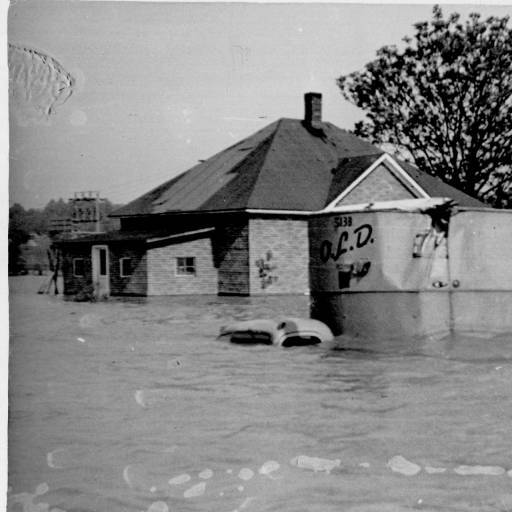 On May 6th, the day after he had finished plowing part of his bottom lands below the levee, he headed his entry “Showers.” The rains continued, and on May 8th came the alliterative notation “River rising rapidly.” Rain and more rain came and Ray thought it the heaviest downpour he had ever seen. That deluge caused the cellar under the century old log cabin he cherished to cave in. By Tuesday morning rumors were torrenting through the town. At 10:30 that Tuesday the state reported that the river would rise to 27 or 28 feet. The levee was built to handle a maximum of 25 feet. Already 24.6 feet of water was thrashing against its dirt walls. The inevitable happened at 7:15 that evening as the strained levee was breached. More than half of West Terre Haute was flooded by morning as the water raged through neighborhoods on the south and west sides. Buildings collapsed, good carried away on muddy tides. On south 9th & 10th streets only the roofs of some houses could be seen above the roiling waters. Those with boats became heroes to their neighbors as they loaded the stranded from roofs or second storey windows. Toad Hop was a lake. The Governor called out the National Guard. Military vehicles hauled in food and water and hauled people out. 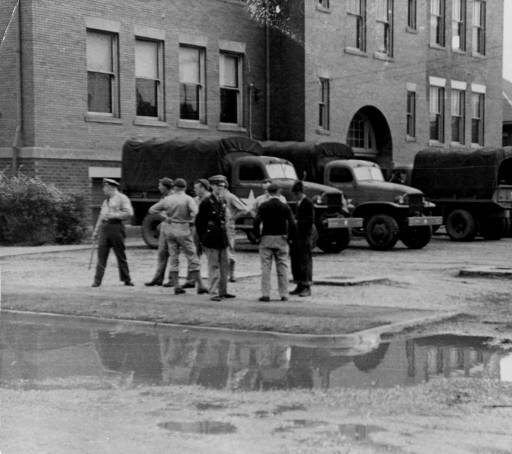 The Central School became home, hospital and dining room to many from the south side, as the military furnished cots, medicine and food to those without shelter. The New York Times featured a photo of guardsmen caring for the children. Waters seeped further into the town on Wednesday. Even Johnson Avenue on the north side was covered from curb to curb. West Terre Haute became an island cut off from the west and south. The railroad and the grade were the only avenues of escape. Those who could took their money, silver and valuables to the bank on Paris Avenue, where Ray and Mrs. Branham, an employee, gave receipts and opened the vault. Another teller, Mrs. Long made it to the bank to help them in the afternoon. She came on the back of an army truck. Ray slept on a cot in the back room of the bank on Wednesday night. Inevitably, some took advantage of the situation, looting the homes and businesses of their neighbors. West Terre Haute was essentially under martial law after Indiana Governor Schricker visited the area. Thursday, Paris Avenue was relatively dry and those who could made their way there. The soda fountain at Berry’s Drugstore was crowded, every seat taken. The town was without water to drink. The river crested at over 30 feet on Thursday. The long-hoped for sun returned on Friday. Slowly the waters ebbed from the town. By Saturday the water was off the Toad Hop road. The National Road was open to automobile traffic. 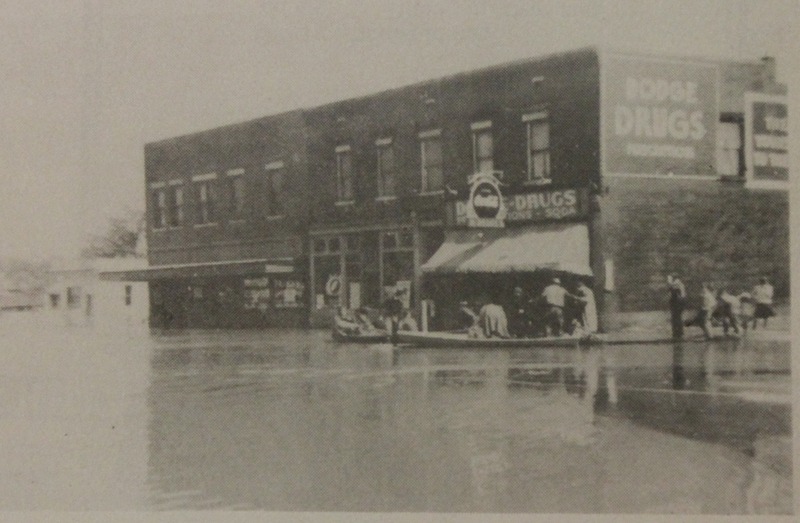 With the roads opened, many of those who had fled to Terre Haute or the north to stay with relatives returned to their sodden homes and mudded streets as newspapers across the nation posited that West Terre Haute had the dubious honor of being the most flood-damaged town in the floods. West Terre Haute had survived again. Charles Ray gratefully returned to his farm.